The temperature has tumbled. To toast the festive season, private members’ club and boutique hotel Devonshire Club has partnered with Highland single malt whisky Glenmorangie and award-winning chocolatier William Curley to introduce a whisky and wood-inspired festive pop-up experience. 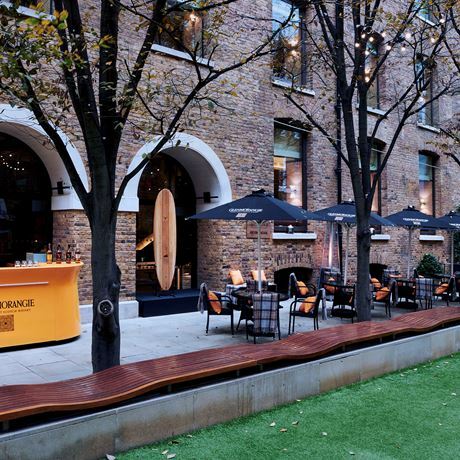 Bringing to life Glenmorangie’s Beyond the Cask campaign, its creative collaboration with Grain Surfboards of Maine USA, the alfresco bar situated on the edge of Devonshire Square will serve warming whisky cocktails and drams, unctuous hot chocolate and bespoke chocolates created to pair perfectly with Glenmorangie. Featuring rich ochre colours, a stylish seating area, heaters and luxurious blankets, the Glenmorangie Original grain surfboard will also be on display, telling the story about what happens to casks once they have been used to make whisky. Appropriately, the Scottish Highlands, where Glenmorangie is born, offer some of the best cold-water surfing in the world. The event is open to both members and non-members.